I love Christmas decorations. I love looking at shiny colourful designs and thinking about decking the halls. But I’ve been learning about how incredibly wasteful and toxic it can be. 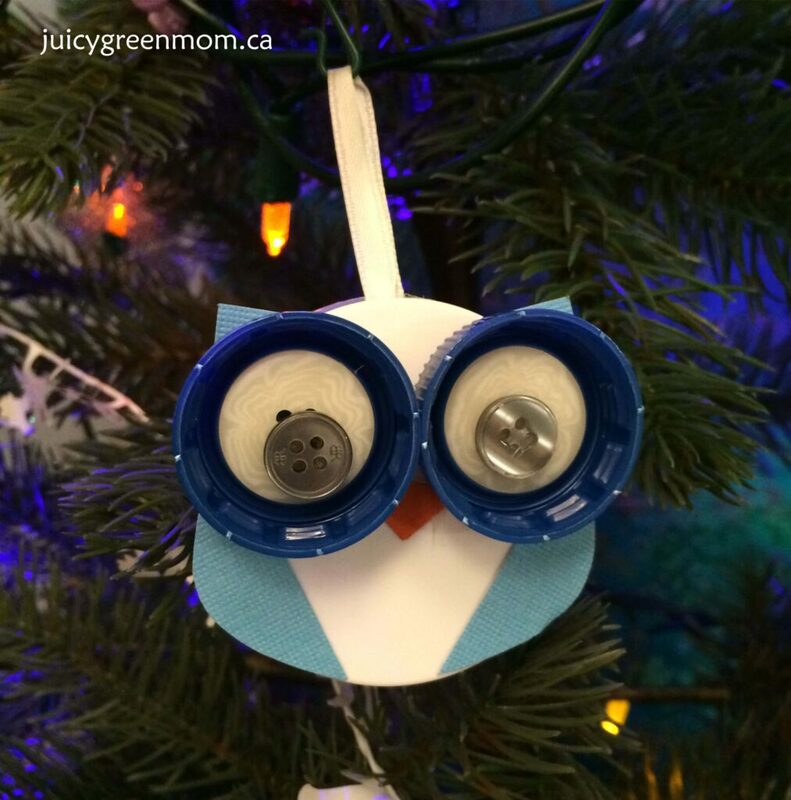 So this year, I decided to do some upcycled & recycled Christmas crafts with my daughter to green our Christmas tree a little more. These are some of my favourites – if you have one to share, please link it up at the bottom of the post! 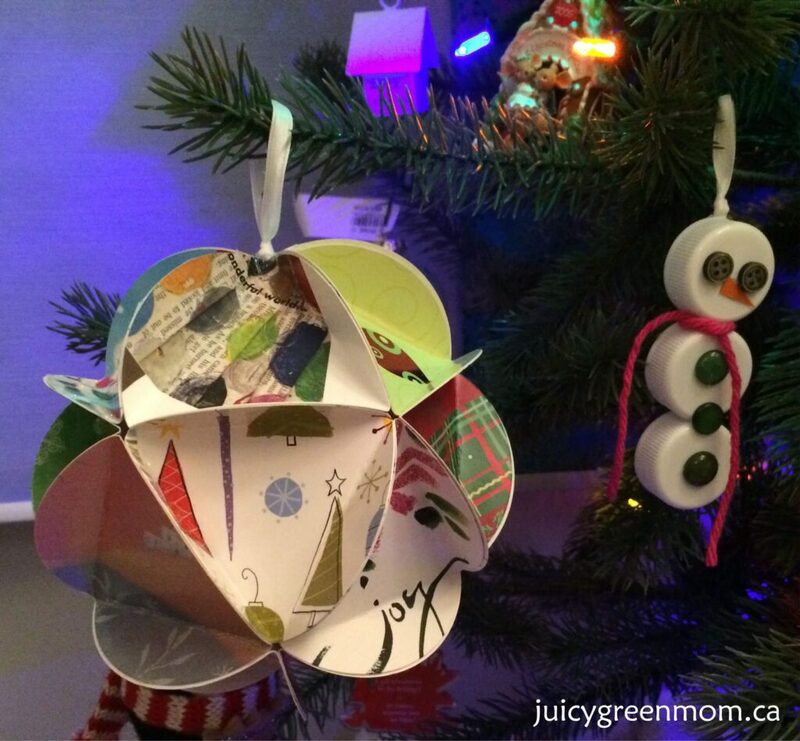 I saw this idea with junk mail at Party Planning Center and loved the idea of doing it with old Christmas cards. I used just 4 circles for one of them because I cut the circle around a few family photo Christmas cards, and wanted them to be pretty visible. A few of my friends always send photo Christmas cards, so I thought it’d be a cool way to use them and think of them during the holidays! I used 6 circles for the other ones we made – the nice thing is you can use as many or as few as you like! This is another fantastic way to use old Christmas cards, and Maker Mama has a really well laid-out tutorial on how to do it. 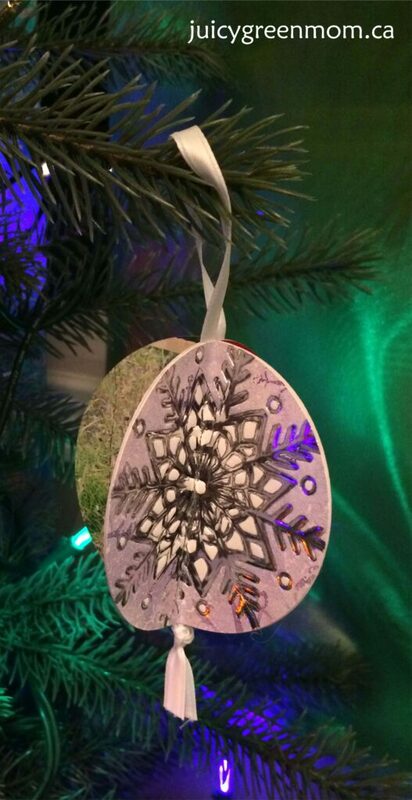 The only difference was that I glued the ribbon into the ornament for hanging, instead of using a hole punch to make a hole in one of the sides. I used a glue gun to make it quick with my impatient daughter. 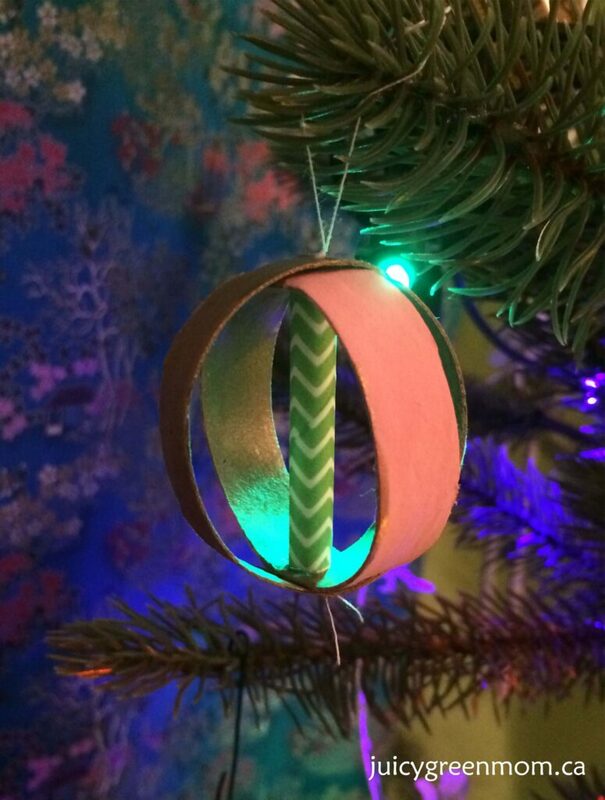 You can buy a similar ornament on Etsy, but why not make your own? I used a large cap from a vitamins bottle as the base, small bottle caps with 2 sets of buttons for the eyes. I cut the wings, ears, and beak from scrap paper to glue on. Another Pinterest-inspiration. I used a glue gun to connect the 3 caps, and to glue the ribbon to the inside of the top one for hanging. I cut the orange triangle for the nose out of scrap paper, and my daughter found small buttons for eyes and on the body of the snowman. A short piece of yarn tied around for a scarf, and voila! The one on Pinterest has beer bottle caps, but I decided to use the copious amounts of other beverage caps we have from milk containers. I used a glue gun to put 6 caps together, and to glue on whatever buttons my daughter chose. I like that this idea is really versatile – you can change up the colours of the caps, and really use anything to decorate them. This is one I came up with by myself and I think it turned out beautifully! I cut a toilet paper roll into 8 pieces so we had 8 circles to work with. My daughter and I painted them (inside & outside). I cut a paper straw (you could use plastic ones too, of course), into lengths about the diameter of the toilet paper roll. Then I used a needle and thread to connect the pieces together. Easy! I wanted to have some smaller ornaments so I thought it’d be cute to glue gun 2 bottle caps together, then glue a ribbon around the edge. 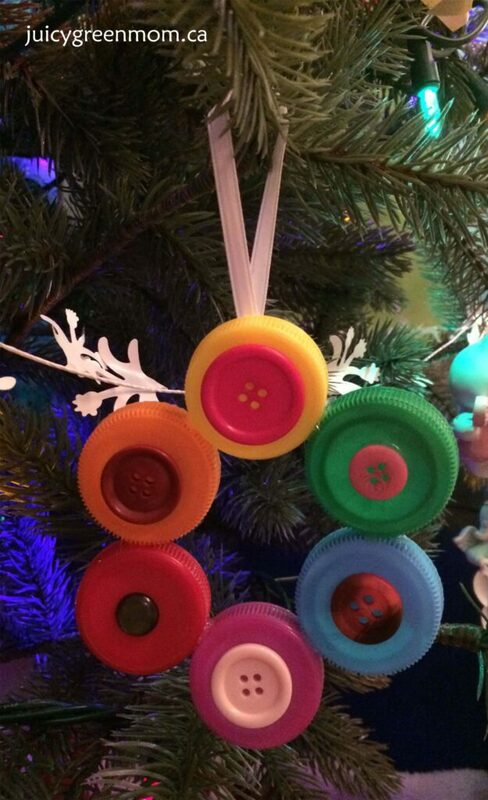 We added some buttons to complete the cute little ornament. 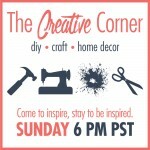 You can use all kinds of things to embellish these too – glitter glue, sequins, you name it! 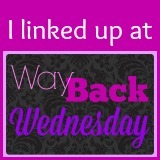 Here’s another post I found from Eclectic Mom Sense with a round-up of other ideas. 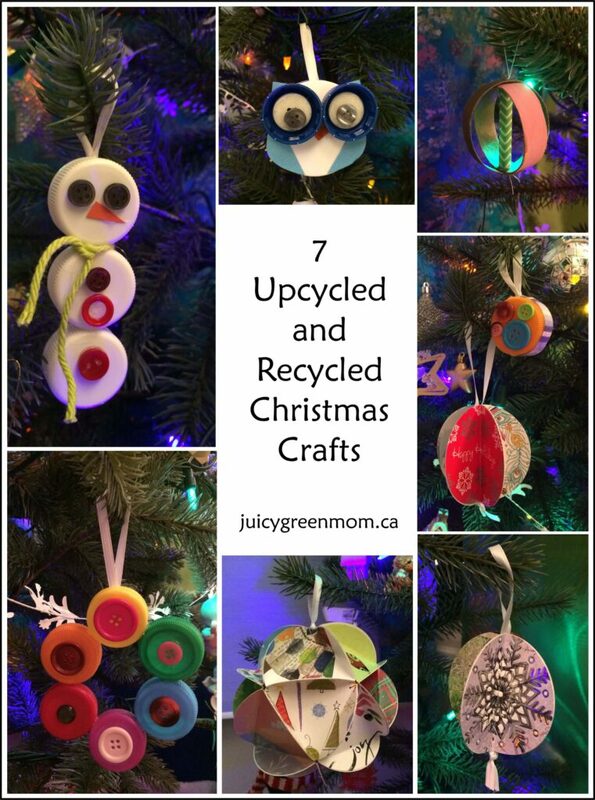 What’s your favourite recycled Christmas craft? Very nice job – they look very classy! Thanks Fiona! I’m pretty impressed with how they turned out too! So cute! I love them all, but especially that owl! Thanks! I think they turned out pretty cute too!